Click the button below to add the 13.56Mhz USB Reader, Mini Size Support MIFARE 1K, NTAG213 (GYR60C) to your wish list. 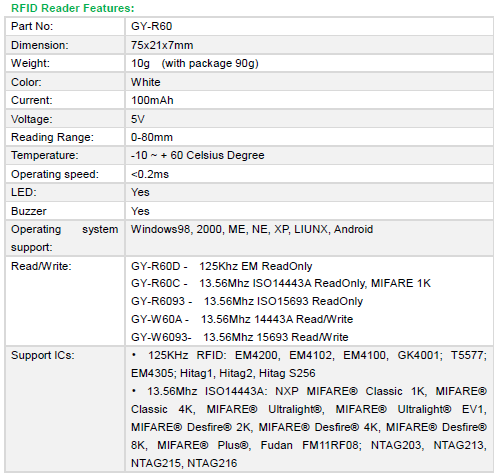 GY-R60 is a kind of USB Reader to support RFID tags reading. As a compact size, it can be easily carried and insert to PC or notebook directly. GY-R60 series RFID reader can support different frequency RFID and different protocols. GY-R60D for 125Khz EM card UID output; GY-R60C is for Mifare Card UID output; GY-R6093 support ISO15693 Card UID output; also has the read/write function devices.